Wanna hook up your Kinect or run a program like Processing on an old vacuum tubeTV but the only input you have are fork leads and screw terminals? This diagram and a couple of pieces of hardware will help you make some pretty cool projects. Depending on what kind of computer you have, will determine what dongle and cables you might need. I have a macbook pro and so ran the signal from the laptop via mini display/VGA cable to the TV View Gold. This piece of hardware converts PC pixels into scans for the TV. From there, I run the signal via Component/RGA to an RF converter. 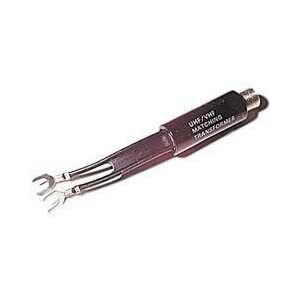 Lastly, the RF signal runs along a coaxial cable into a fork lead adapter found at any radioshack.